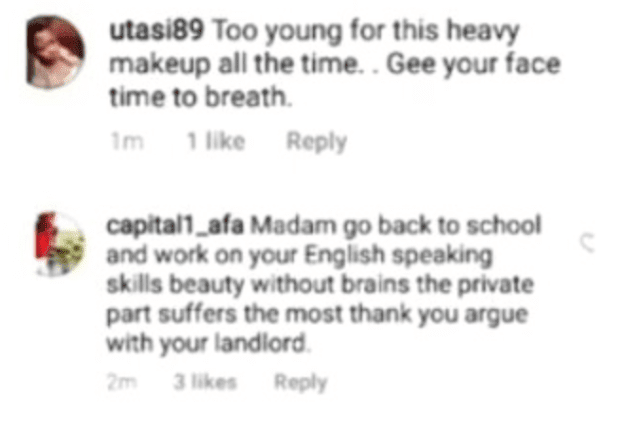 “Beauty without Brain is Nothing, Madam go back to School”- Fans slams Nina after she shared video of herself talking. Former Big Brother Naija 2018 finalist, Nina has come under fire from her followers after she shared a video, showing off her heavy make up and expensive dress as she addresses some issues flying around. After speaking and clearing the air on the whole controversies surrounding her and her romantic partner ‘Miracle’, the light skinned beauty took to her Instagram to show off her expensive dress and heavy makeup but some fans are not down with it, as the return was not pleasing to her.They quickly bashed her and advised her to go back to school and forget all the rich and famous life style. Also, that beauty without brain is nothing. Stay connected for more updates from big brother naija 2018 housemates.